Georgien ist im Umbruch, seine neue an Europa orientierte Generation im Aufbruch. Das Gastland der Buchmesse Frankfurt 2018 will auf den internationalen Kongressmarkt. Weggefährten sind die GIZ und das Beraterteam „Enited“. onntag, 7. Oktober 2018, 03.44 Uhr. „Back again, this time for a whole week :-)“, schreibt Ivo Franschitz seinen Freuden auf Facebook aus dem Radisson Blu Iveria Hotel in Tbilisi. Tbilisi oder Tiflis ist die Hauptstadt Georgiens. Längst beherbergen internationale Hotels wie das Holiday Inn Tbilisi, das Tbilisi Marriott oder das Courtyard by Marriott Gäste aus aller Welt. Ivo Franschitz ist das fünfte Mal aus Wien angereist. Der Inhaber und Geschäftsführer der Beratergruppe „Enited“ ist seit 30 Jahren im Eventbusiness und hilft neuen Ländern auf die Weltkarte für Kongresse. Georgien liegt an der Grenze zwischen Europa und Asien, im Westen umgeben vom Schwarzen Meer, im Süden der Türkei und Armenien, im Osten von Aserbaidschan und im Norden von Russland. 1991 erklärt die kleine Kaukasus-Republik ihre Unabhängigkeit von der Sowjetunion. Im Ranking „Ease of Doing Business“ der Weltbank steht Georgien 2017 auf Platz 9, also vor 181 Ländern wie Deutschland. Längst hat sich das Land an die Europäische Union angenähert und 2014 ein Assoziierungsabkommen unterzeichnet. Bürger aus EU-Ländern reisen ohne Visum ein. Als Gastland auf der Frankfurter Buchmesse 2018 erzählt das „Land im Umbruch“ mit 70 Autoren seine wechselvolle Geschichte anhand der 33 „Characters“ seines Alphabets und einem Wortspiel: „Georgia – Made by Characters“. With the support of Ivo Franschitz the Convention and Exhibition Bureau of Georgia is working on a strategy for business events. Das Förderprojekt von Oktober 2017 bis Oktober 2018 sieht in der ersten Phase eine Strategie für die Destination vor, basierend u.a. auf einer SWOT-Analyse, und eine strategische Richtung anhand einer Mission und Vision sowie Zielen und KPIs. In der zweiten Phase werden Unternehmensleitlinien und Wissens- und Lerngruppen definiert und ein Trainingsprogramm, eingeführt beim Kick-off mit Workshops zu Kollaboration und Bidding Master Classes vom 8. bis 12. Oktober 2018. „Alle Teilnehmer zeigten ein großes Interesse und Engagement. 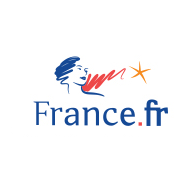 Die Notwendigkeit eines gemeinsamen Denken und Handelns war ein Kernthema“, fasst Franschitz zusammen. Das stärke das CEBG, nicht nur als Sprachrohr am internationalen Markt, sondern für die Entwicklung im Land. Franschitz: „Die zwölfmonatige Zusammenarbeit lief reibungslos und partnerschaftlich ab“. Die Partner sind Venues, Hotels, PCOs und DMCs, vorgestellt im englischsprachigen Guide „Meetings & Events“. „Englisch wird unter der jüngeren Generation gesprochen, ebenso wie Russisch und Deutsch”, unterstreicht Ivanidze. Jeder dritte der fünf Millionen Georgier lebt in Tiflis. 31 Airlines verbinden sie mit 39 Direktflügen über die drei internationalen Flughäfen Tbilisi, Batumi und Kutaisi. 20 km sind es vom Tbilisi International Airport in die City, die sich europäisch anmutend entlang des Flusses Mtkvari und zu Füßen der Festung Nariqala ausgebreitet hat. tw: Event planners look for new and emerging destinations, but Georgia is not well known yet in the Western hemisphere. How do you want to change this? Amiran Ivanidze: Georgia has become a very trendy destination in terms of leisure. Lonely Planet named Georgia one of the top ten destinations to visit in 2018 and similar referrals have been made by TripAdvisor, CNN, Forbes and BBC Travel. 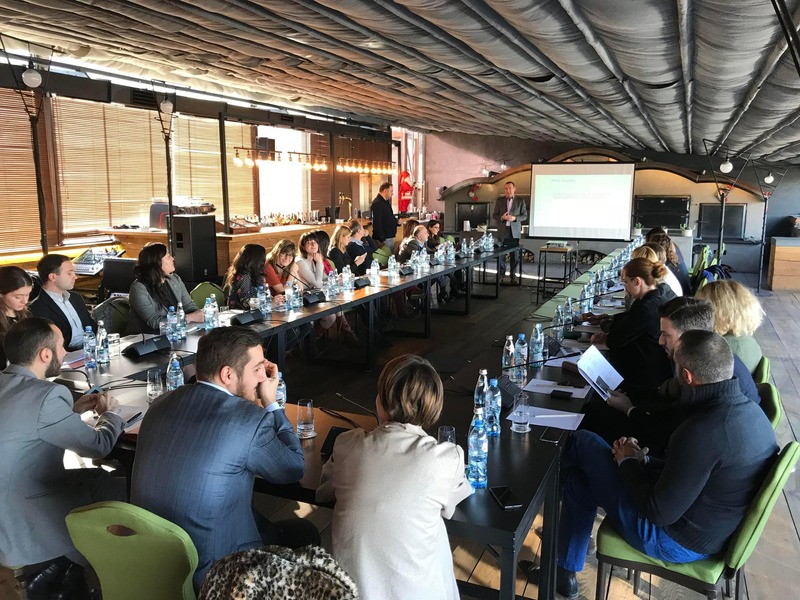 Though this awareness created by the Georgian National Tourism Administration – of which the CEBG is part of – we are building the awareness for our MICE potential. We have been exhibiting at IBTM World and IMEX Frankfurt for several years and are participating in B2B workshops such as IBTM Arabia and M&I Forums. Since 2013 we are an ICCA member and move up in the ranking: 2017 we became first in the Caucasus and Central Asia region, surpassing countries like Qatar and Kazakhstan. Furthermore, on 22 and 23 October we hosted the Georgia International Meetings Forum in partnership with ICCA, inaugurated by our Prime Minister Mamuka Bakhtadze and ICCA President Nina Freysen- Pretorius. It is another step to position Georgia as a MICE hub between Europe and the Middle East. How did you manage to get financial support by the GIZ to develop a strategy for business events? GIZ has been a long-term partner of the Georgian Government and the Georgian National Tourism Administration in implementing standards and training for the local population. 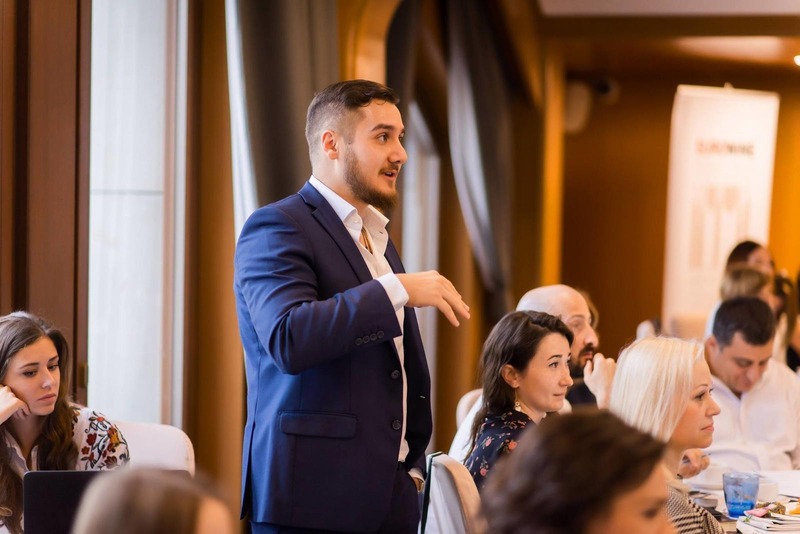 When we approached them and explained the need for a strategy for the Convention and Exhibition Bureau of Georgia and the training of the private sector in business events, it was a new field for them and a project they had not yet been worked on in the region. Since the establishment of the CEBG in 2016, we have solidified Georgia as the MICE hub of the region. We portrayed this to GIZ and that whatever standards will be implemented in Georgia, could be used by our neighbors Armenia and Azerbaijan. With this global picture, GIZ was glad to be on board. Why should corporations and associations choose Georgia for their conferences? We are the new emerging European destination, the hidden gem of Europe according to many publications. We are also ranked 5th in the world in terms of safety and security (Numbeo crime index ranking), which is a big USP nowadays. Georgia has a lot of cultural and historical value to add to events. It is also economically more viable to conduct events here. We offer high quality service at affordable prices: The average rate for a 3- or 4-star hotel is around 100 USD. In terms of association meetings, Georgia has a very developed banking, medical and wine industry sharing knowledge with international colleagues. On the other hand, we have industries that are in need of education and experience from their more matured counterparts from abroad. 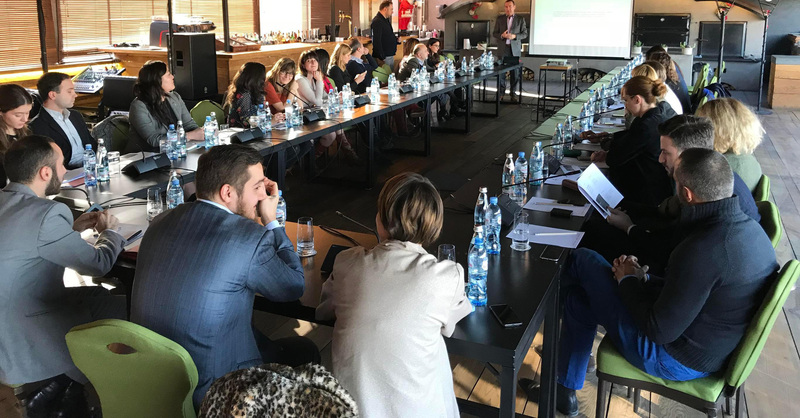 Hence, conducting association meetings in Georgia will also benefit the country and the population in terms of education, which is an important for some associations. How does the Convention and Exhibition Bureau of Georgia support meeting managers? The CEBG has 48 members from the private sector; 18 DMCs, two PCOs, two venues and 24 hotels. We connect clients and international PCOs and to our members, who take care of their needs, starting from organizing the conference to creating incentive programs. Which international conference did you win lately? The latest bid that we won – and actually the first international bid we worked on – was the 18th World Federation of Tourist Guide Association Conference (WFTGA), which we won in 2017 in Tehran and will be hosting it in Tbilisi in 2019. The WFTGA will take place at the Biltmore Hotel Tbilisi with a ballroom for 550 persons. Are there plans for a purpose built international convention centre in Tbilisi? Thus far nothing concrete. However we know that it is crucial to have a convention centre in the upcoming years. What we are trying to figure out now is who should build it – a private sector initiative or the government? We are doing a case study right now to see how other destinations opened their convention centres. Zehn Minuten sind es von der Altstadt zum Messe- und Kongresszentrum „ExpoGeorgia“, das seit 2005 Mitglied beim internationalen Messeverband UFI ist. Während der Sowjetzeit diente ExpoGeorgia als Gelände für die permanente Ausstellung der industriellen und landwirtschaftlichen Errungenschaften der Sowjetunion. In den Neunziger Jahren privatisiert, stehen die elf multifunktionalen Hallen mit 300 qm bis 1.700 qm heute Planern offen. Ebenso wie die vielen Kulturhäuser etwa die Tbilisi Concert Hall, das Opera House oder das Rustaveli Theatre. Kongresse mit um die 500 Teilnehmern finden Platz in den Ballsälen des Hôtels & Préférence Hualing Tbilisi oder des Biltmore Hotel Tbilisi. Rahmenprogramme wie Klettern und Skifahren, Wasserrafting und Kajakfahren legen der Kaukasus und das Schwarze Meer nahe. Dort empfiehlt sich das Seebad Batumi mit dem Hilton Batumi, Sheraton Batumi Hotel und Radisson Blu Hotel Batumi, alle mit Tagungsräumen. "The business tourism sector focuses on attracting significant numbers of visitors and, at the same time, promoting the development of other sectors and adopting international experience at the local level, along with sharing knowledge and introducing the best practices, which is imperative to our country." Georgian Prime Minister Mamuka Bakhtadze in his speech during the International Meetings Forum of Georgia, which was held in cooperation with the International Congress and Convention Association (ICCA) on 22 and 23 October 2018 at the Biltmore Hotel Tbilisi. "The Georgia International Meetings Forum was inaugurated by our Prime Minister Mamuka Bakhtadze."